The other night was just about right for a spring survey on the Green River: not much wind, partly cloudy aloft, mostly cloudy right above the river—but not the kind of clouds that bring rain. These were clouds of winged critters, mostly midges. The bug clouds were so thick that at times, breathing deeply was done at the peril of inhaling one (or a handful!) of the little fellers. Midges and all, we made it through night one just fine. At least they weren’t mosquitoes. This night ran a little longer than survey nights in the past, but equipment issues weren’t the hang up—it was because there were so many fish to handle. As usual, we conducted the first night of the survey at Tailrace, the mile-long site just below Flaming Gorge Dam. 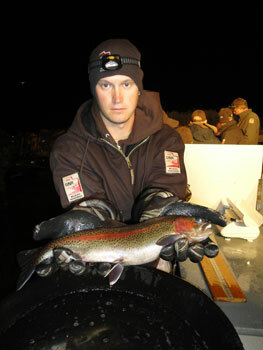 Ian Kennedy, UDWR technician, holds a rainbow trout from the Tailrace survey station on the Green River. Our total catch was 681 fish, including 443 rainbows, 236 browns and a couple whitefish. Our PIT tag recapture rate was around 19 percent, which is similar to what we normally see. The big fish of the night was a rainbow trout that stretched the measuring stick to nearly 22 inches, while the longest brown was just less than 19 inches. But the heaviest trout was a brown that weighed 2.5 pounds at just 17 inches—now that’s a healthy fish! Overall, the fish were in pretty good condition, especially the plump rainbows. The river’s bug populations seem to have really benefited by the prolonged high flows last spring and summer. In fact, there have been reports that hatches this spring have been of far greater magnitude than any other spring in recent memory, including abundant hatches of midges, mayflies and stoneflies. Healthy bug populations are, of course, good for the fish. I didn’t believe that the report from night one’s survey at Tailrace could be topped, but night two at Little Hole was absolutely incredible. Again, the weather was about perfect, except maybe a little too calm—a light breeze would have pushed some of the bugs out of the way. They were even thicker than the night before. This time, inhaling them was not even a matter of breathing deeply, you only had to open your mouth. 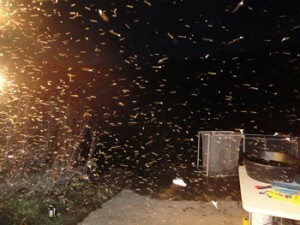 But again, at least they weren’t mosquitoes! Bugs (mostly midges) swarm the floodlights during the Little Hole electrofishing survey. The boat and shocking equipment ran perfectly and we were able to collect and work through a lot of fish pretty easily. Our total catch was slightly less than the haul at Tailrace, but still totaled 579 fish, including 360 browns, 205 rainbows, a couple handfuls of whitefish and even a few sculpin. The big fish of the night was a brown that measured 19 inches and weighed 2.7 pounds. The longest rainbow measured just under 18.5 inches and weighed close to 3 pounds. The heaviest fish of the night was a rainbow that weighed just over 3 pounds, but measured 17.4 inches—an inch shorter than the longest rainbow. Overall, the trout were in superb condition, particularly the rainbows. Talk about healthy fish—and remember—these fish are from the river, not flat water. There have been many recent reports from satisfied anglers with comments about how the river is fishing right now. Combine that with our observations during these surveys last week, and we’re very pleased with the status of the trout populations in the river and excited about the outlook for this fishery. With so many healthy trout and their willingness to take flies and other lures, now really is the time to fish the Green River! As in the past, we had a lot of help with this survey and express our thanks to all who came out to assist in this important effort. We couldn’t do it without you.